We have seen that up until the British Conquest of New France in 1763, the vast majority of Canadians were francophones, Quebecois and Acadians, born in the soil of North America. The total number of immigrants who came to Quebec and Acadia, from the first settlements Samuel Champlain established in the first decade of the 1600s until 1763, was very small. In Quebec, only 8,527 immigrants arrived during this entire period (from 1608 to 1759). In Acadia, a few hundred settlers arrived in the first half of the seventeenth century, and thereafter it was the high fertility rates of Acadians that engendered a population of roughly 13,000 by the 1750s. How about the role of immigrants from "diverse" places after the Conquest? Was not the English-speaking Canada that emerged after the Conquest, in Ontario and Nova Scotia, created by arrival of immigrants "from many ethnic backgrounds", as standard college textbooks religiously inform their students today? Don't you believe them. The immigration time line from 1760 to 1815, which is the subject of this article, and which includes the Loyalists as the principal new settlers in Canada, can only be categorized as a period of "many new diverse immigrants" through the manipulation of words. a massive growth in the population of Quebec through the continuation of high fertility rates with zero francophone immigration, and minimal arrival of British individuals. an internal migration of New Englanders and Loyalists from some regions of British North America to other regions of British North America, principally to Upper Canada and Nova Scotia. Both New Englanders and Loyalists were long established native born British settlers in the American colonies, not immigrants. the arrival of immigrants from the British Isles (with the exception of some Whites from Germany) should also be identified as movement by internal migrants, from the British Isles to other British lands. The English population in New France/Quebec numbered only about 500 in 1765. When the British conquered Quebec they anticipated that significant English-speaking families would move from the British American colonies to the British Canadian colonies. They hoped that in this way Quebec would be gradually Protestantized and Anglicized. But only "a few hundred English-speaking, Protestant immigrants, largely merchants" had arrived by 1774. The number of English has been estimated at 2000 in 1780. In the 1780s, a few thousand Loyalists did arrive. There are no precise estimations as to how many Loyalists settled in Quebec proper, rather than what would become Upper Canada or Ontario, which was carved out from the western side of New France in 1791. In any case, when this partition occurred, the English population in Quebec proper, or Lower Canada, was about 10,000. Meanwhile, the total non-Aboriginal population of Quebec in 1791 had increased substantially since the Conquest from about 60,000 to about 160,000. Now, assuming that all the English speaking inhabitants, the 10,000, were immigrants, we can safely say that Quebec's francophone population increased by 150,000 souls solely through a high fertility rate without any immigration. It has been estimated that the English population in Lower Canada/Quebec reached 30,000 by 1812. The francophone population, meanwhile, increased to 335,000 by 1814. 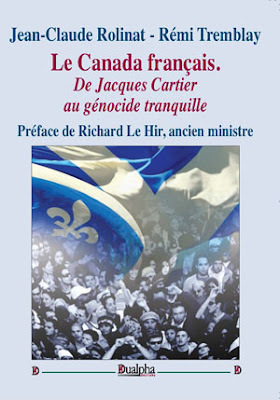 Again, assuming that the 30,000 English speakers were all immigrants (hardly the case, since after the Loyalist influx of the 1780s there was little immigration from the English world), it follows that the history of one of the two founding peoples of Canada, the Quebecois, was a history without any significant immigration from 1608 up until 1814. Therefore, it is simply an act of malicious deception to identify the Quebecois as immigrants. Between 1758 and 1762, before the arrival of the Loyalists, about 7000 to 8000 New England "Planters" settled in Nova Scotia in the lands previously occupied by the Acadians who had been expelled in the 1750s. But half of these Planters left within a few years, finding Nova Scotia too scarce in resources and good lands. These New Englanders were British-Americans who moved from one British-ethnic land (New England) to another British-ruled land (Nova Scotia), which was fast becoming Anglicized after the expulsion of Acadians. The estimated number of Loyalists who came to Canada has been estimated at 50,000. 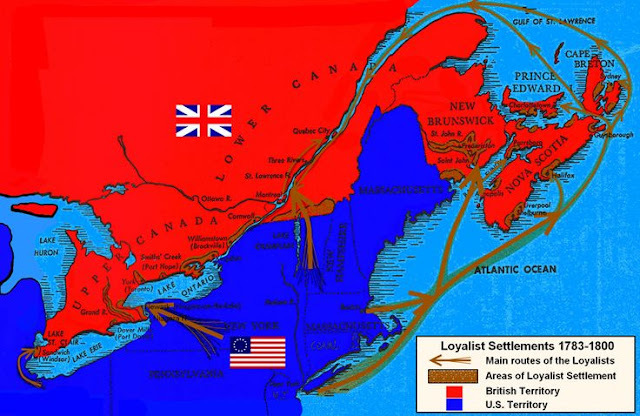 About 14,500 Loyalists went to the new territory of New Brunswick, which was partitioned from Nova Scotia in 1784. About the same number went to Nova Scotia, 400 to Cape Breton, and some 500 to PEI. 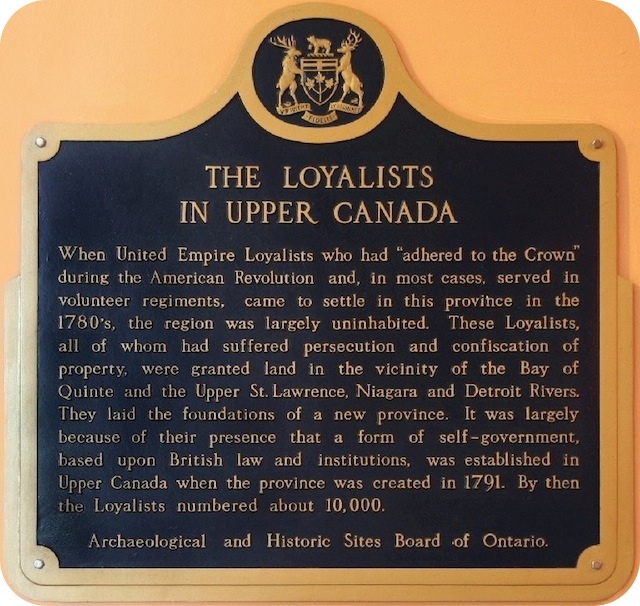 Roughly about 14,000 Loyalists went to Lower and Upper Canada, mostly to the latter territory, during the 1780s and 1790s. The popular textbook, Origins: Canadian History to Confederation, by R. Douglas Francis, et. al, refers to the Loyalists as immigrants who came "from many ethnic backgrounds" (p. 233). It notes that "as many as 500" "black Loyalists" (p. 237) were brought to Upper Canada and some 3000 to Nova Scotia). A History of the Canadian Peoples, by possibly the foremost historian of Canada, J.M. Bumsted, likewise refers to the Loyalists as "quite a disparate group" that included "well over 3000 blacks", as well as 2000 Aboriginal "loyalists", who settled in Upper Canada (p. 101). He notes, though, that nearly half of the Blacks soon emigrated to Africa. There is no way around the fact that, as the text Origins eventually admits, the "overwhelming majority of the Loyalists were white". Even if we were to accept the rather wishful claim that blacks and Aboriginals were "Loyalists" (American colonists who remained loyal to the British Crown during the American Revolutionary War), the total non-White proportion was only 7 percent. Moreover, it is more accurate to identify Loyalists as "internal migrants" rather than immigrants, since they actually moved from colonies that were thoroughly British to territories rule by Britain that were becoming, Nova Scotia and Upper Canada, increasingly Anglicized. It was essentially a movement by Brits within the Anglo mainland of North America. 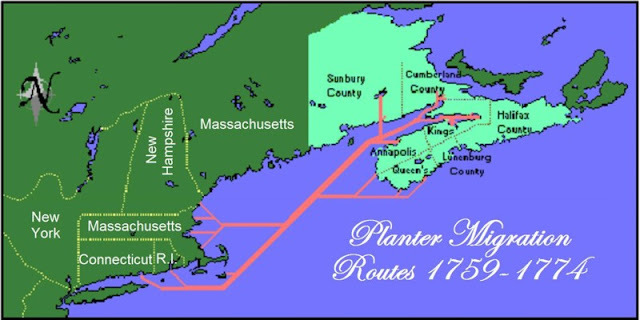 Some may reply that this argument only holds for the New England "Planters" but not for the Loyalists, since the Loyalists were leaving the newly independent American lands of post-1776. They were Americans rather than British. But this is not a good argument for two reasons: the Americans were indeed a new people created in the soil of North America, but they were still racially British, and the Loyalists were called "Loyalist" precisely because they remained loyal to British rule, rather than American rule in the thirteen colonies. The texts I have examined don't always provide consistently precise numbers, but only indicate that from 1790 to 1815 immigrants from the "British Isles" came to Upper Canada, mainly from the Scottish Highlands and Ireland. One estimate has it that between 6000 and 10 000 immigrants came in the early 1800s from the Highland to the Maritimes and Upper Canada. Another text says that in the 1760s and 1770s Nova Scotia saw some 2000 settlers arrived from Ireland, 750 from England, and, in 1773, 200 Scots. Before these immigrants from the Isles, Nova Scotia saw the arrival of some 1500 German Protestants in the early 1750s. Taking into account these immigrants, Bumsted portrays (p. 86) Nova Scotia in the late 1760s, that is, before the arrival of the Loyalists, as a land characterized by ethnic and religious diversity. He sees the arrival of Loyalists as adding more to this diversity, with the "black Loyalists". But we already saw that Blacks were a very small proportion of the total population, and that the Americans, both the New England "Planters" and the Loyalists, were internal migrants. It can also be added that the immigrants from the Isles were all English-speaking, very closely related genetically and culturally, moving from the British Isles to an increasingly Anglicized Nova Scotia and a newly-created Anglicized Upper Canada. The Acadians added, and I suppose all the different groups did as well, an intra-European ethnic diversity, a French-British diversity combined with some German Aryans. The most reasonable conclusion we can reach about immigration patterns in Canada's history from 1763 to 1815 is that it was an internal migration movement within a British world in mainland North America, and across the Atlantic from the British Isles to British North America. The demographic growth that Upper Canada experienced from the 1760s, when it was barely populated by Europeans, to 1815, was quite substantial, from 14,000 inhabitants in 1791, to 70,718 in 1806, to 95,000 in 1814. The Loyalists undoubtedly played a key role in this demographic expansion. For example, in Upper Canada, in 1812, American inhabitants, or with American ancestry, made up about 80 percent of the population of 136,000. It is not exaggeration to say that the Loyalists were the original founders of Ontario, and the original internal migrants who did the most in the introduction of British culture and political institutions to Canada. Similarly, in Nova Scotia, immigration from the British Isles, and internal migration from British/America contributed, to the demographic growth of Nova Scotia after the expulsion of the Acadians. We will see in a future article that immigration from the British Isles was to increase substantially after 1815. We will see, too, that these immigrants are best identified as pioneers or settlers. Outside the francophone communities, Anglo pioneers were creating a world of Canadian Anglo ethnicity, British rule of law, language, and religions, not a world of multiple cultures and races.